For a lot of people landscape is something they travel through or past, barely acknowledging it in the maelstrom of modern life, unless it is something spectacular. Hathershelf Scout above the Yorkshire town of Mytholmroyd is one of those places that most would consider unremarkable. It lacks some of the photogenic qualities of the dales, has been a place where criminals and coin clippers hid in the 18th Century, has a drawn for those with suicidal thoughts was once a tip and hides a lethal secret. However, Benjamin Myers would disagree. 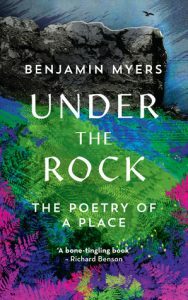 Not only is it his home patch of landscape, but he can walk through tangled woods that lead up onto a crag that has its own stark beauty, its brooding gritstone seeping into his psyche as he uncovers the geological and personal histories of the place that run deep into the bedrock. Entwined with the landscape that he walks every day he can, he starts to discover that the remarkable exists in the mundane and ordinary, the imperceptible daily changes that slowly build to make the seasons feel like they have arrived in a rush. His writing is split into the four elements that make up the view he can from his window, wood, water, earth and rock and he uses these to explore all manner of other subjects as he walks with his dog, Heathcliff. Nothing escapes his gaze or thought process, he considers the invasive species alongside the natural, acknowledges the life of the animals that cross his path as much as their deaths. History is as important to him as the modern political issues of the day. He swims regularly in the wild and shockingly cold waters in the local pools and plays a part in helping in the community with the floods in 2015 when Mytholmroyd partially disappeared beneath the brown waters of the River Calder after days of rain and watches as a landslide takes a sizable chunk of the hillside away. It doesn’t stop him exploring though as he snags his coat on the keep out sign as he climbs over the fence. It is a difficult book to characterise as it encompasses so much within its pages. It is as much about the natural world and the landscape of that part of Yorkshire and Myers covers subjects as diverse as political discourse to folklore, industrial music to slugs, asbestos to ravens. Most of all it, this book is about place; that small part of our small country that he has grown to love since moving out of London. I have read two of his other books, Beastings and The Gallows Pole, just before I got to this one and I found his writing in those captivating. This is no different, his mastery of the language means that you feel you are alongside him as he looks out over the valley, or clambering up the same path behind him as the water runs down through the rock. I really liked the Field Notes at the end of each section, these are short and elemental poems as well as a small number of black and white photos that add so much to the rest of the book. If you have read Strange Labyrinth or 21st Century Yokel then this should be added to your reading list. Brilliant book and highly recommended.